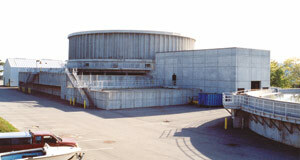 Precast concrete treatment facilities / tanks save time and money. They can store or treat anything from potable water to hazardous waste to solid storage bins. Storage capacities can range from 0.4 to 120 megaliters (100,000 to 30 million gallons). Precast concrete wall elements are usually pretensioned vertically in the plant and post-tensioned horizontally through ducts cast in the panels. Joint closures are usually poured concrete on site. 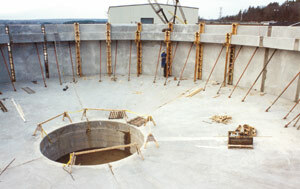 This method of sealing the joints allows the tank to perform (after post-tensioning) as a monolithic structure to resist hydraulic, temperature and seismic forces. Off-site fabrication of wall and roof elements (under extremely well controlled conditions in the precast plant) means higher quality and reduced labour on-site. Virtually any storage structure can be built using precast concrete. Other parts of a tank structure, such as columns, beams and roof slabs, may also be precast concrete. Contact Strescon Limited for more information and design recommendations.